A picture taken on June 1, 2018, shows a view of destroyed buildings in a rebel-held area in the southern Syrian city of Daraa. The Syrian government is deploying its military forces in southern Syria, in preparation for a looming offensive against the southern governorates of Daraa and Quneitra, as confrontation in the north and northeast are winding down. Abdulllah Nassar, a member of the White Helmets in Daraa, told VOA that people are bracing themselves for the offensive. “The Free Syrian Army is on alert, and everyone is planning for a battle,” Nassar said. The Syrian regime continues to drop leaflets in the area urging armed opposition and civilians to follow the footsteps of the rebels who evacuated eastern Ghouta. Local activists shared images of the leaflets on social media. In an attempt to control strategic Lajat hill in eastern Daraa, the Syrian army is trying to divide the armed opposition-controlled area in the south into two. 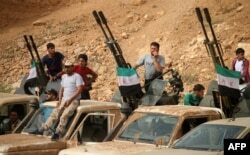 Syrian officials have visited the government-controlled areas in the south. This comes two days after Syrian Minister of Defense Ali Abdullah Ayyoub visited the southern area to check the preparations for the offense, according to Syrian State Media (SANA). One of the most popular among the regime’s supporters is Tiger Forces, or Qawat Al-Nimr, led by Suheil al-Hassan. Established in 2013, the Tiger Forces became an important force for Syria and Russia. Syrian rebel fighters man anti-aircraft guns mounted in the back of pickup trucks during a military parade near the southern city of Daraa on June 7, 2018. Jordan brokered a cease-fire agreement in southern Syria between the U.S. and Russia in July 2017. But the Syrian government has not agreed to the de-escalation agreement, despite the fact that its ally, Russia, was a party to the deal. The Syrian government continues to drop leaflets in the area giving armed opposition two choices — surrender or die. After the gains achieved by the Syrian government, with support from Russia and Iran in recapturing swaths of land from rebel groups in 2017, the three allies shifted attention to the remaining territories in the south. Sergei Lavrov, Russian Minister of Foreign Affairs, said last May that the Syrian government should be in control of its borders, adding that all foreign forces must withdraw from the southern borders. The U.S. Department of State has issued a statement expressing its concerns toward the impending escalation by the Syrian government in the southwest de-escalation zone, warning of “firm and appropriate measures” against the Syrian government’s violation of the cease-fire, and holding Russia responsible to compel the Syrian government to the agreement. “The cease-fire must continue to be enforced and respected,” the June 14 statement said. 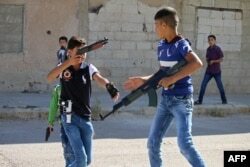 Syrian children play with fake plastic guns in the streets of Daraa, southern Syria, on June 15, 2018. Israel and Jordan are trying to avoid a new conflict on their borders with Syria. While Israel is concerned about Iran’s military presence close to its borders with Syria, Jordan is concerned about another influx of refugees. Negotiations between the U.S., Russia, Jordan and Israel are taking place in a search for an exit to the military action on the southern borders. Joe Macron, a researcher at the Arab Center in Washington, told VOA that the main actors in the region are still waiting for the results of the negotiations before launching any major military action. What is important for Jordan is two things: “Not allowing more refugees to get in, and not opening the strategic Nasib border crossing,” Macron said. Jordan’s Minister of Foreign Affairs, Ayman Safadi, told U.N. envoy to Syria Staffan de Mistura in a phone call that Jordan is working on preventing a fight on its northern borders and preserving the stability, Jordan news agency Petra reported. Safadi emphasized the importance of committing to the cease-fire between the U.S. and Russia, adding that this agreement was one of the most successful ones. Imad K. Harb, a Washington-based analyst at the Arab Center, told VOA that Jordan never really had an antagonistic relationship with the Syrian regime, adding that Israel’s security must not be neglected when looking for solutions. “The issue here is what is beyond the borders in Syria,” Harb said.